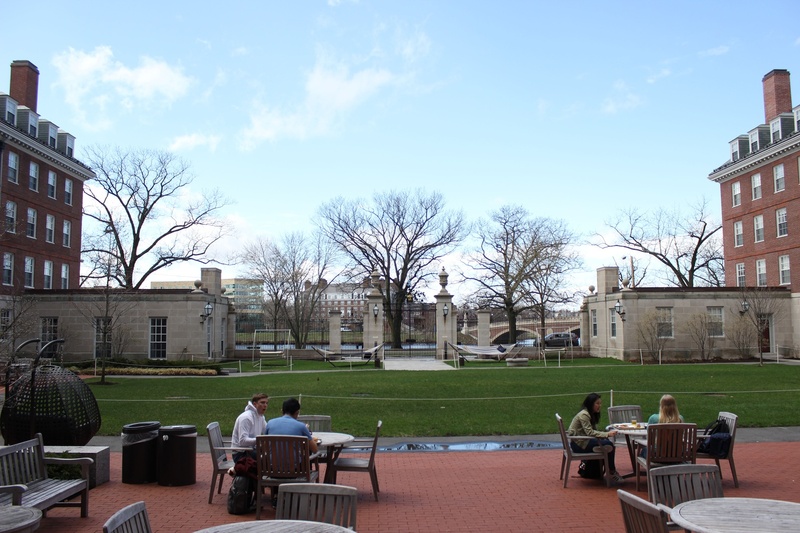 Students enjoy their lunch in Dunster Courtyard, where the annual Goat Roast is held. Some Dunster residents’ discomfort with the event and health concerns flagged by a environmental health inspector motivated the decision to end the tradition, Kelly wrote in an email to house residents Friday. He also wrote that Dunster will continue to hold a “goat roast” this year, though without the traditional roasting of a goat. “Cheryl and I have decided that the goat roast this year will not include the traditional ritual of slaughtering, transporting, and, in the main Dunster Courtyard, skinning the carcass of a goat with paleolithic tools,” the email reads. Harvard Associate Director of Environmental Public Health Valerie Nelson said she informed the faculty deans of the health risks associated with the handling of animal carcasses earlier this year. “If you just grabbed a goat from someone's farm that was sick and carrying an illness that's transmissible to humans, some of those might be leptospirosis, cryptosporidium, Q fever,” she said. Dunster House Committee co-chair Shannon T. Beattie ’20 said the procedures Nelson outlined for safely handling a goat seemed too logistically difficult to put in place and continue the tradition. Beattie said she enjoyed the goat roast because of the conversations it sparked in the house, despite being a vegetarian and not eating any of the goat. Iris R. Feldman ’20 also said she thought that the discomfort caused by seeing the meat prepared and cooked was valuable for her classmates who eat meat in the dining hall. “I think that that discomfort in some ways was very productive because, if you are comfortable eating meat in the dhall, but you aren't comfortable with the goat roast — those are the same thing,” Feldman said. Dunster’s annual goat roast began in the 1980s as a spinoff of a primitive survival course taught by Human and Evolutionary Biology Professor and then-resident tutor Daniel E. Lieberman ’86. Each year, after the goat is skinned in the courtyard, students and house staff marinate the carcass in lime, curry, salt, pepper, herbs and garlic. After marinating overnight, dining staff roast the goat on a spit over a bed of coals. Lieberman said the goat roast was always an educational event during his time in Dunster House. “It had an educational purpose, which is to teach students how our ancestors survived for millions of years,” he said. Kelly floated the possibility of a roast “in the fashion of the White House Correspondents’ Dinner” or a “goat petting zoo” to replace the annual barbecue in his Friday email to Dunster residents.